For the veterinarians at the Detroit Zoo’s Ruth Roby Glancy Animal Health Complex, animal patients come in all shapes and sizes, and we are responsible for investigating and solving all kinds of interesting medical conditions. 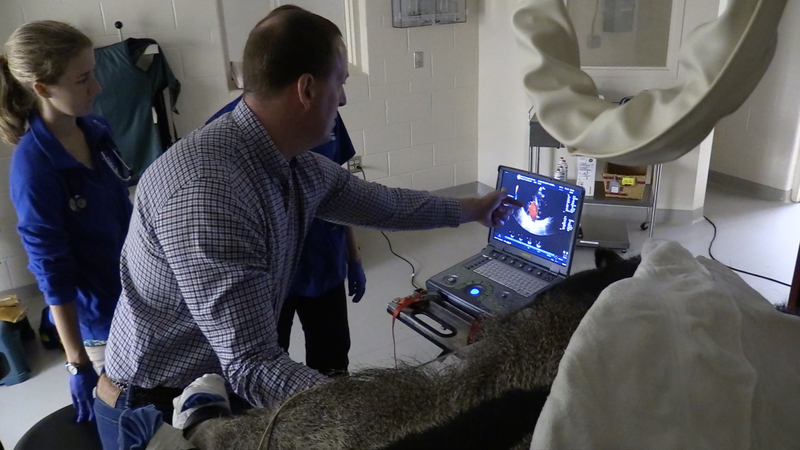 Although we are experts in zoo medicine, we sometimes seek assistance from veterinary and human health experts, including Dr. Bill Brown, a board-certified veterinary cardiologist. While in his regular practice he examines mostly dogs and cats, he has been assisting us at the Zoo for more than 20 years, during which time he has examined seals, lions, binturongs, polar bears, yellow anacondas and a Hoffman’s two-toed sloth. We recently asked him to assist us in performing cardiac ultrasounds on a species that he had not examined before – giant anteaters. Giant anteaters are one of my favorite species. There are currently two females living at the Detroit Zoo, ages 21 (well beyond life expectancy) and 9. Anteaters are uniquely adapted to feed primarily on ants and termites, and have several interesting anatomical features. They have an elongated muzzle and a small mouth, which makes it impossible to pass an endotracheal tube into the trachea during exams. They also have no teeth and a very long (up to 18 inches!) slimy tongue, which they use to gather insects and pull them into their mouths. In order to do a full physical exam on an anteater, we need to use anesthesia. 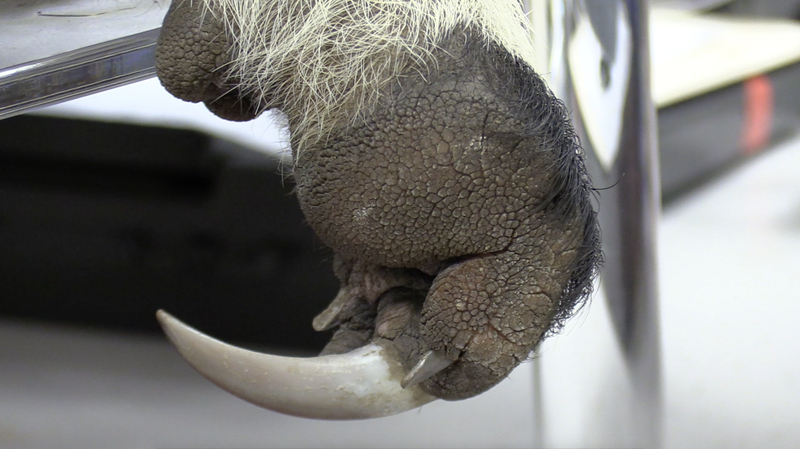 Their powerful front arms allow them to tear apart termite mounds quickly, so during these examinations, we cover their large, curved claws with towels and tape to ensure no one is injured should the anteater begin to move. 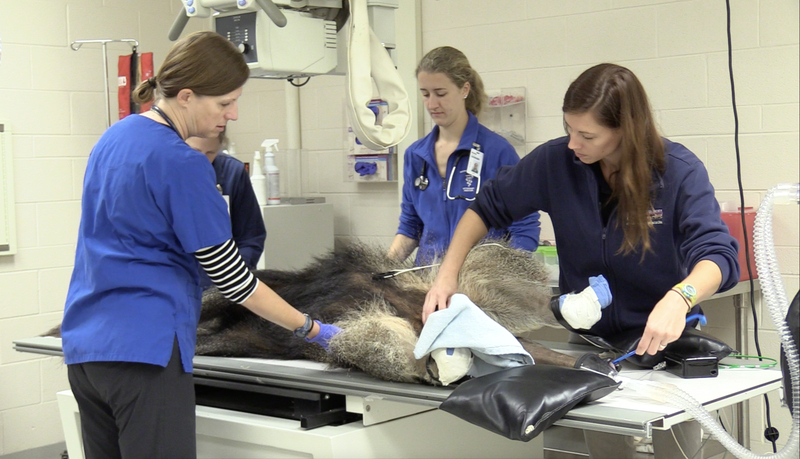 A recent survey of the 50 zoos caring for giant anteaters in North America showed that cardiac disease is one of the top five causes of illness in those aged 6-15 years. Young anteaters can also develop heart disease, and all ages can develop dilated cardiomyopathy (DCM). This condition results in an enlarged heart with thin chamber walls, and has been shown to occur in anteaters whose diet consists of inadequate levels of taurine. We have been aware of this nutritional need for years, and therefore structure the diets for the anteaters at the Detroit Zoo specifically to avoid DCM. We perform cardiac ultrasounds during routine exams to visualize the anatomy and function of the heart. In the past, we have found that their narrow chest shape and broad ribs make it difficult to obtain the images we need, especially from the right side. Dr. Brown was able to obtain all of the standard views and measurements taken during a cardiac echocardiogram, and found that both anteaters have normal heart anatomy and function, which means that their heart valves are not leaky, and their chamber walls are normal in thickness. – Dr. Ann Duncan is the director of animal health for the Detroit Zoological Society and oversees the Ruth Roby Glancy Animal Health Complex at the Detroit Zoo. I really enjoy these articles about the wonderful animal care at the Detroit Zoo. The anteaters are always so much fun to watch and I’m always surprised at how large they are. It’s interesting to read more about them. Thank you, Dr. Duncan, for taking the time to write and share this article. I’m glad the anteaters are in good health.